June | 2011 | NICE! Site of Danish furniture all in a simple and elegant style. The site has a nice layout, smooth and simple animations – all in all a good site – would be a good layout for a portfolio or photographer’s site. Well made, simple and elegant. 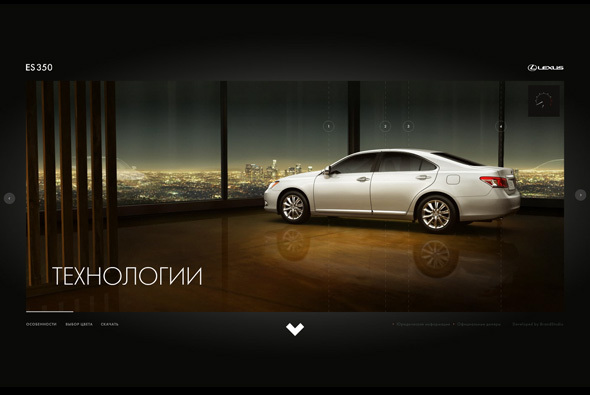 Slick site promoting the Lexus ES 350 in Russia. 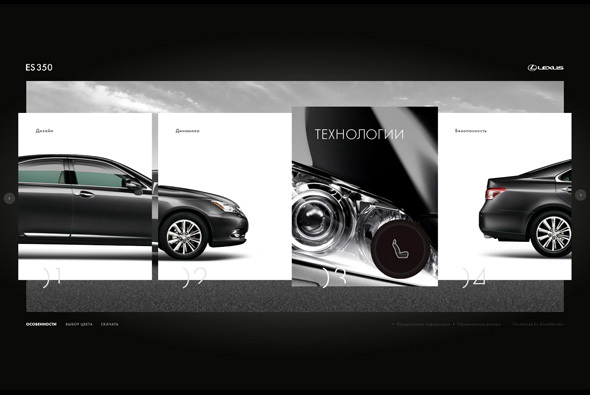 In keeping with the previous Lexus Russian sites, they are incredibly well realised, slick, and well designed. Simply an interactive catalogue, but full of nicely crafted 3d fly throughs and sequences, nice animations and transitions. 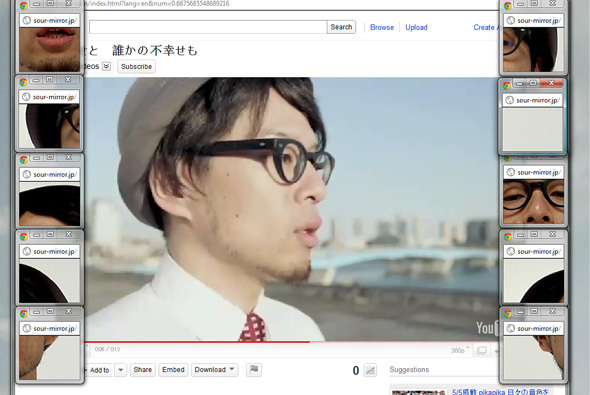 Funky experience, an interactive music video from the Japanese band Sour. A mixture of all kinds of media and APIs, connects with Facebook, Twitter and even your webcam for a tailor made site. 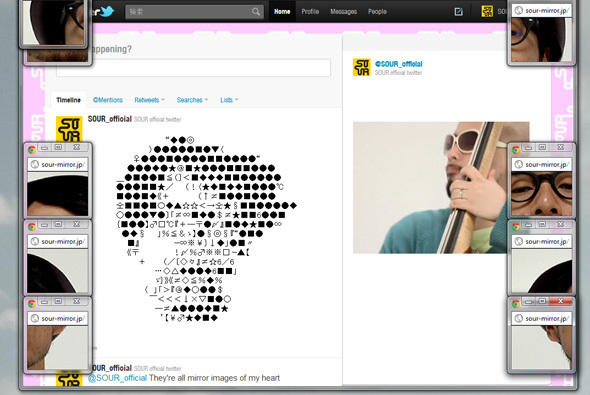 Uses Flash & HTML5 all together, love the image mosaic and the dancing man made of google images. Sadly it only works in Chrome or Safari but it is worth it. All great fun and it makes you smile. 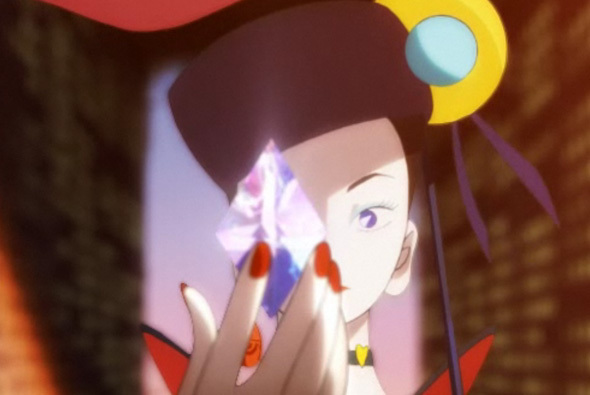 Created by Masashi Kawamura, Qanta Shimizu, Saqoosha, and Hiroki Ono. 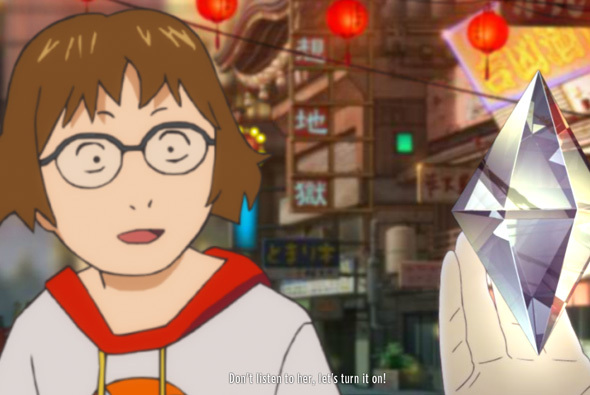 Stunning interactive Anime experience which warns teenagers of the dangers of smoking. 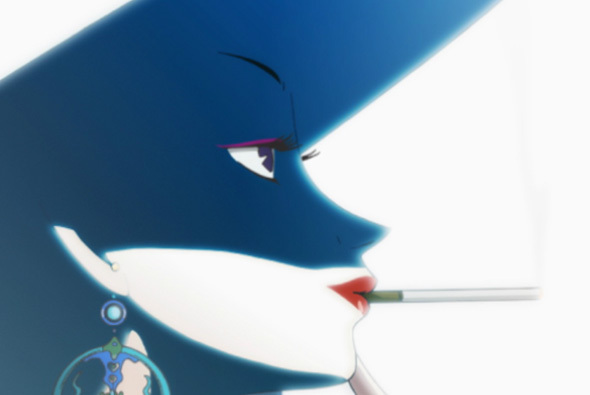 Featuing Koji Morimoto’s Anime style the story unfolds of the ‘attraction’ to smoking, in a uniquely Japanese way of an interactive video – when prompted you can look around or make decisions – all very basic but nicely done. Really quite strange but very beautiful. Created by DDB Paris and unit9. Online exhibition showing the Polish AFA degree show’s finest items. 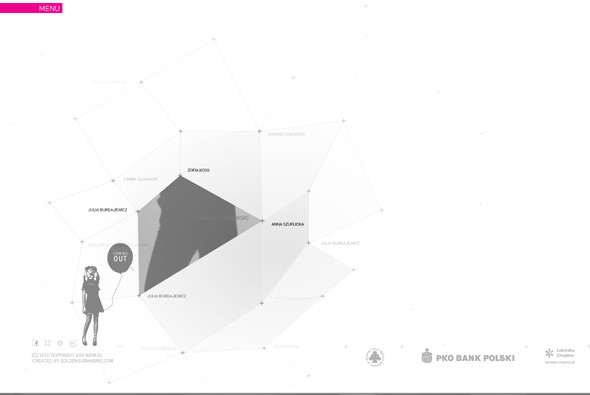 An amorphous grid showing the items can be explored to find out more. Nice smooth animations and minimal look and feel – letting the work do the talking. 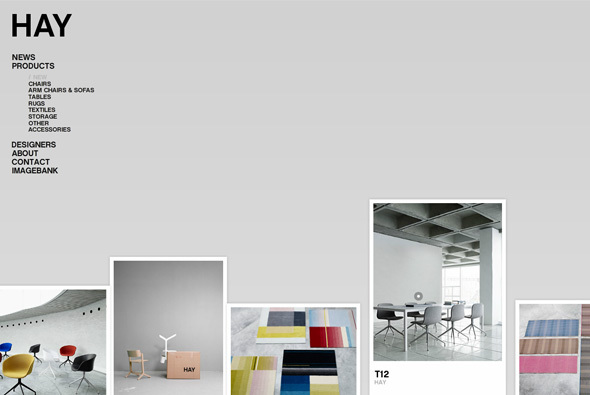 Good transitions and layout. 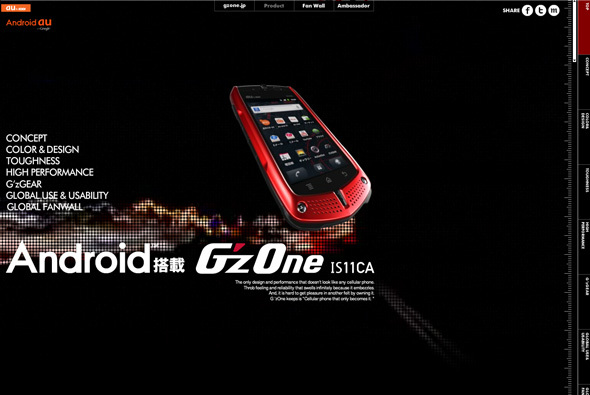 Super slick site promoting Casio’s G’zone One tough mobile phone. 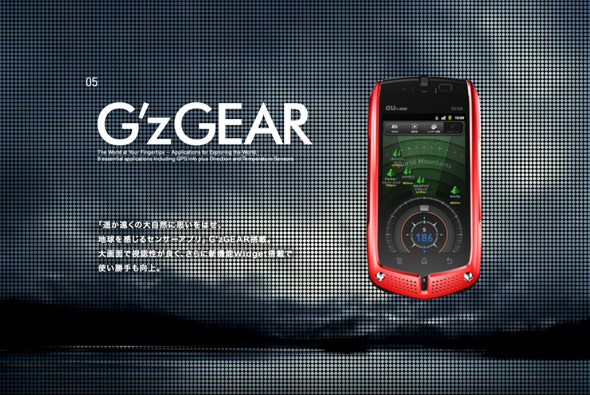 Featuring lots of slick transitions and full video backdrops for each section highlighting the phone features. Look and feel and animation is all good, love the transitions, slick and smooth. Created by Pyramind Film Quadra Inc.
A Italian photojournalist’s portfolio. Another nice photography site, like the way you scroll intuitively to the left and right, nicely presented with nice transitions and animations. Simple and effective. 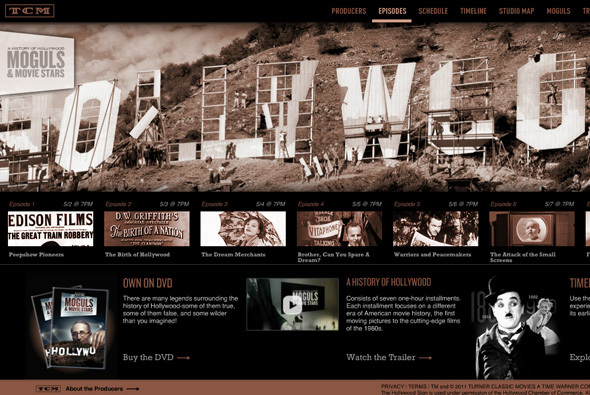 Site promoting TCM’s show, by offering a glimpse into the history of Hollywood. 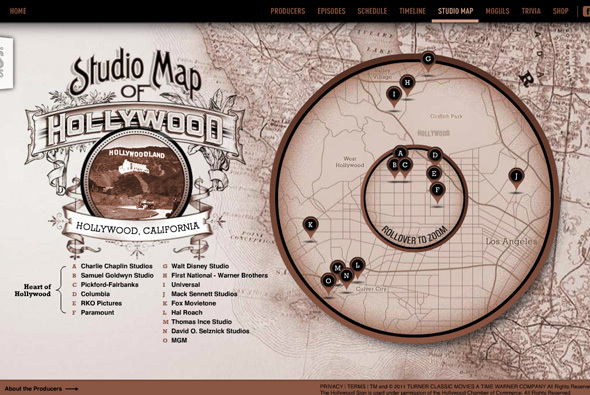 Beautifully tasteful crafted site, nice animations, and a great look and feel that ties it all together. Love the build and transitions, very smooth and slick. Created by 1 Trick Pony. 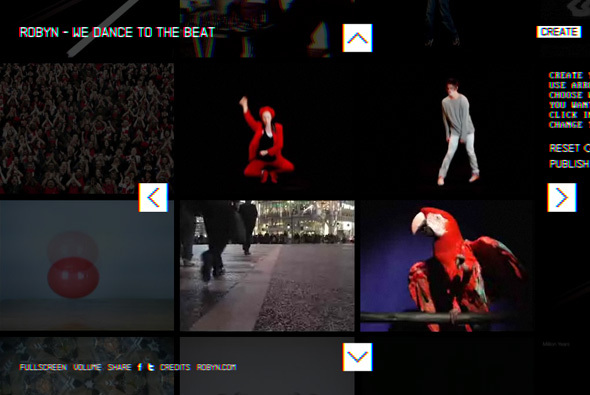 Nice little site combining music and video, you can create your own beats, browse beats made by other people, and watch Robyn’s new song. 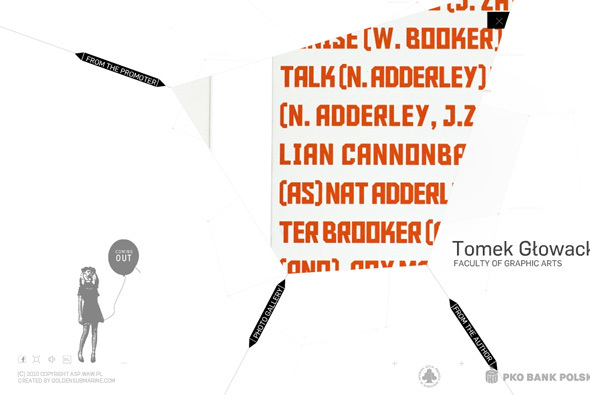 Really nice style and interactivity, the end result is a bit chaotic – but a bit of fun. Created by Blip Boutique and DinahMoe. 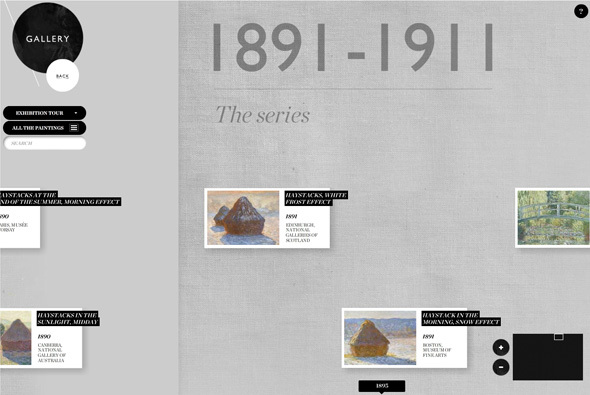 Beautiful site promoting a historic Monet exhibition at the Grand Palais, Paris in 2010. 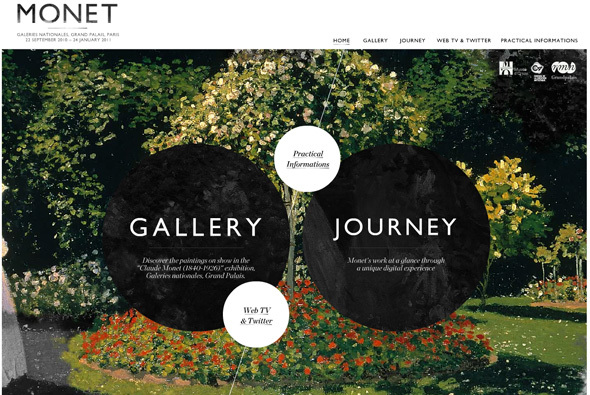 The site aims to bring Monet’s paintings to life, there is an interactive journey through Monet’s life and a gallery with his paintings. 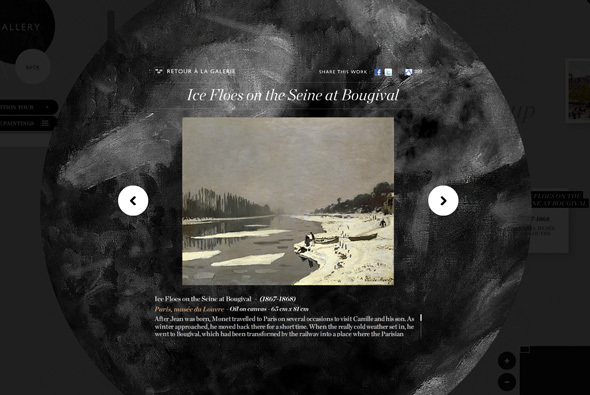 Great functionality when zooming into the paintings – fantastic attention to detail. I love the gallery section and the general look and feel – bright colours on canvas – esque backgrounds, lovely transitions, well integrated video – all wrapped up in a smart well designed interface. Created by Les 84, and faberNovel. 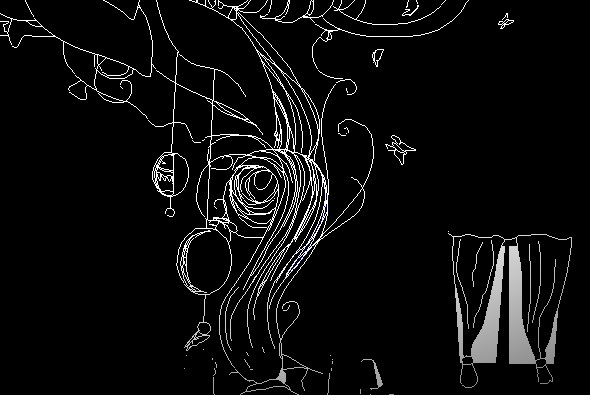 A small interactive art project all in pixel style which projects the imaginary thoughts of a sleep girl into a never ending canvas of animations. I like it’s simplicity, the animations are fantastic, simple and beautiful. Created by Richard Schumann, Kim Koster, Stephan Schulz and Johannes Bunemann. 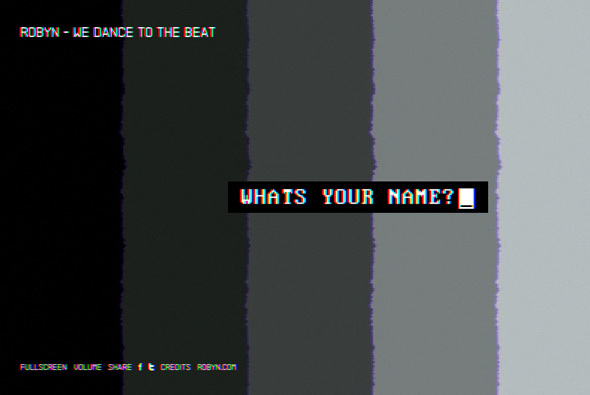 Interactive music video using the latest HTML 5 effects. 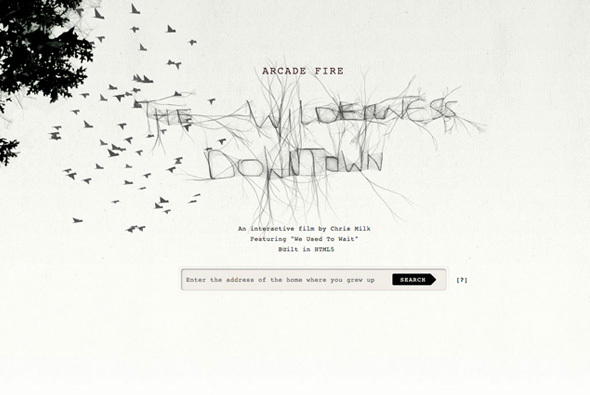 Another great interactive music video for ‘The Wilderness Downtown’ by Arcade Fire, which also acts as a showcase for Google’s browser Chrome. 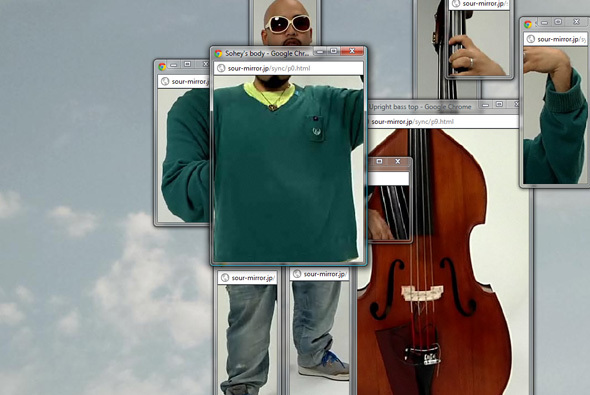 You enter your home town on the start screen and the music video plays whilst pop-up windows open displaying streetview and google maps follwing the running character in the music video – all as if the character is actually there in the scene. New events happen as the music plays all in time with the music. An interesting way to show a video and involve the audience into the emotional side of the song – all digitally – very creative. 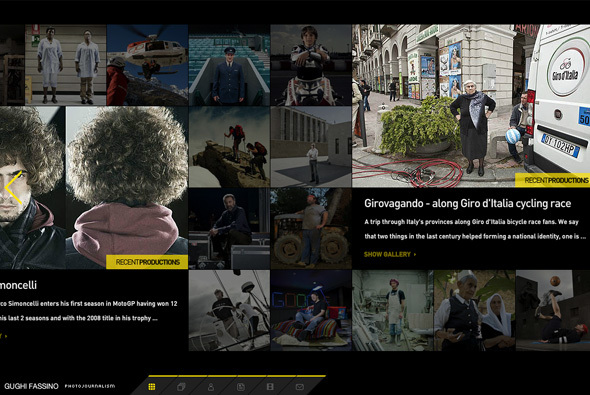 Created by Chris Milk, Aaron Koblin, Google Creative Lab, radical.media, and B-Reel. 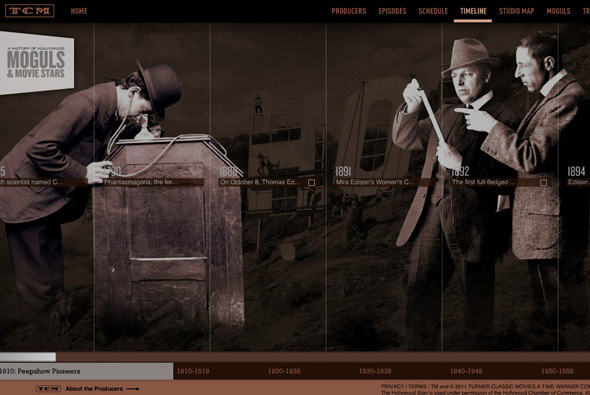 New design and a choice selection of the best creative websites out there.